AlienVault — Bangkok System & Software Co.,Ltd. Security That’s Unified, Simple, & Affordable. Get Complete Security Visibility in One Day. Our goal is to provide you with a unified threat detection and compliance management solution that is both easy-to-use and affordable. 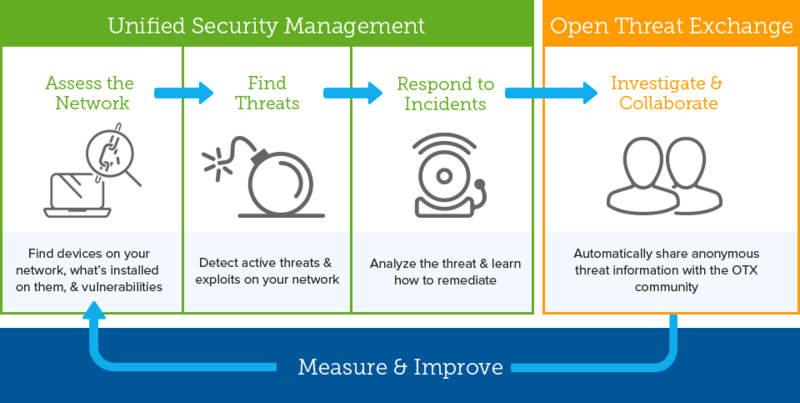 We’ve built all of the essential security capabilities you need into one Unified Security Management™ platform, which is then powered by up-to-the-minute threat intelligence from AlienVault Labs and our Open Threat Exchange™—the world’s largest crowd-sourced collaborative threat repository. The result is a powerful solution that delivers on its promise of complete security visibility. The AlienVault Unified Security Management™ (USM) platform provides five essential security capabilities in a single console, giving you everything you need to manage both compliance and threats. Understanding the sensitive nature of IT environments, we include active, passive and host-based technologies so that you can match the requirements of your particular environment. – It’s Unified Security Management! Traditional SIEM solutions promise to provide what you need – but the path to get there is one most of us can’t afford. Traditional SIEM solutions integrate and analyze the data produced by other security technologies that are already deployed, but unfortunately most mid-market organizations don’t have those other technologies deployed yet! AlienVault USM provides a different path. In addition to all the functionality of a traditional SIEM, AlienVault USM also builds the essential security capabilities into a single platform with no additional feature charges. And AlienVault’s focus on ease of use and deployment makes it the perfect fit for mid-market enterprises and organizations with limited budget and few in-house resources. Assess. Detect. Respond with USM. Assess the Network to Find Devices, Services & Vulnerabilities. Busy IT security teams don’t have the time or the resources to research the latest threats on their own. Our team of security experts in AlienVault Labs, constantly monitors, analyzes, reverse engineers, and reports on sophisticated zero-day threats including malware, botnets, phishing campaigns and more. Unlike single-purpose threat intelligence focused on only one security control, AlienVault Labs Threat Intelligence delivers eight coordinated rulesets, fueled by the collective power of the Open Threat Exchange. AlienVault Labs Threat Intelligence leverages the built-in USM security capabilities for you to identify the latest threats, resulting in the broadest detection of attacker techniques, to inform effective responses and defensive strategy. Unlike preventative-only security tools (e.g., firewalls, anti-virus, etc. ), and single-purpose monitoring tools (SIEM, IDS, vulnerability assessment, log management, etc. ), AlienVault’s USM platform provides a unified approach to threat detection and compliance management. We don’t make false promises of 100% protection with our USM platform, but rather quickly detect threats and accelerate compliance by delivering unified and coordinated security monitoring capabilities, powered by the latest threat intelligence and access to a community of practitioners for collaborative defense. Achieving complete security visibility can be time-consuming, costly and complex. Collecting the right data, aggregating it, normalizing and correlating disparate technologies for a complete view of your security posture isn’t trivial. Discover a new way with AlienVault. Complete Visibility for Immediate Answers. What’s happening right now that could signal a data breach? What do I need to do right now in order to prevent service outages or malware outbreaks? Are the security controls in place doing their job? Or do I need to reconfigure our defenses? Where do we need to focus in order to be ready for our audit next week? Get Immediate Results on Day One. Deploy the technology needed to comply with requirements in: PCI DSS, HIPAA, ISO 27002, SOX, GPG 13 and more.